The middle of the Edo period saw a development in urban life and the population of tea practitioners greatly increased. 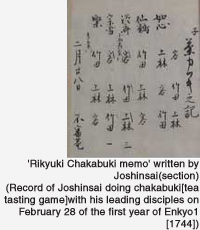 The 6th Iemoto Kakukakusai (1678-1730), while preserving the tradition of Rikyu's chanoyu searched for new ground and achieved a free style of tea. He later became tea master to the 8th Shogun Yoshimune and was given the karatsu ware tea bowl called Kuwabarajawan. The 7th generation Iemoto Joshinsai (1705-51) is known as the restorer of chanoyu and is said to have laid the foundation of the present Iemoto system. As the number of tea practitioners increased, chanoyu leaned towards becoming a light accomplishment, and the shichijishiki (seven exercises) were devised as a new way of practising. Also, the utensils that had been handed down at the Iemoto since the time of Rikyu were put in order and appraisals written to go with them (kakitsuke). In Genbun 5 (1740), on the occasion of Rikyu's 150th anniversary, the Sodo (Founder's Hall) was built to enshrine a statue of Rikyu. Also the Rikyu yuige (death poem) which had become separated from the Sen family after the death of Rikyu was brought back by the Fuyuki family of Edo, making its return to the original founder Rikyu. Also, in the 'Iioki' letter to his son Sottakusai (1744-1808), Joshinsai makes it clear that the secrets of chanoyu will only be passed on to one son, the eldest. This became an important guideline when it came to the succession to the position of Iemoto. The 9th generation Ryoryosai (1775-1825) became tea master to the 10th generation Lord of the Kii Tokugawa family, Tokugawa Harutomi, who among the successive Kii Lords was especially knowledgable about chanoyu and received the kaiden (certificate of mastery of chanoyu) for Rikyu's way of tea. In his last years Ryoryosai gave a tea gathering for him at the Iemoto. The present main gate at the Iemoto was a gift from the Kii Tokugawa family of this time. Then when the young Kyukosai (1818-60) became head of the family after the death of Ryoryosai he received the kaiden that had been given to Harutomi by Ryoryosai, preserving the tradition of Omotesenke Sado.